Not far out of Kyneton, Black Hill is about 40 minutes drive from Bendigo, or a bit over an hour from Melbourne. The shadowy forest rises upon its isolated mound, surrounded by open paddocks, beckoning the unwary to the "dark side" with a crooked finger. "Slabs" it whispers. "Bolts", it promises in a hollow, raspy voice. Those that fall prey to its clutches, will be rewarded for their route finding skills with good granite edges, and a chance to tick some superb low to mid 20's routes with a bolt or two below them. While there are a lot of bolted lines, you'll still need a trad rack to protect many of the climbs. Access is from Ennis road or Black Hill road, both of which can be found by taking Edgecombe road from the Calder highway's Kyneton by-pass. (See: approach map). At the end of Ennis road you'll find a car park and an information shelter. Whichever method you took to get in, you'll eventually get to a walking track that pretty much circumnavigates the entire hill. Other tracks criss-cross the hill. The best stuff is in the "Northern Group", situated, as the name suggested, towards the north end of the mound. Work your way to the "eastern lookout" and, nearing it, where it's sign posted, kind of bush bash down to the north-east a bit. You'll work it out. Allow about an hour for scouting, if this is your first visit. With any luck you'll come across some other climbers who can point you in the direction of a few starred routes. Above Left & Right: Me leading "Milawa", the 23m grade 17 slab route. Below Right: Unknown climbers on "Deceit", 20m grade 14. Newcomers, I suggest you try and make your way to the bolted slab called "Milawa" (pictured above left and right), the 23m grade 17 slab, and then work outwards from there. The scariest part of Milawa is clipping the first bolt. After that it's just delightful slabbing to the top, with closely spaced bolts and great friction. Bolt one can be pre-clipped by delicately balancing up left of the arête, as in the picture above. The route proper starts on the slab itself, just right of the arête. There are chains for a belay. If you're looking for a warm up in the Northern Group area, try "Deceit", the 20m grade 14 with three bolts (pictured right). It doesn't get a star, but is, none-the-less still a fun climb. To it's right you'll find an array of progressively harder and harder slabs, including "Barefoot & Pregnant", the 23m grade 19 near the right of this face. From memory it's a nice climb, and sports a belay bolt. Left: Brett standing at the base of "Scratch and Sniff", the 22m grade 20. "Touch And Go", the 20m grade 17 is on another block to the right. Below Right: Kent bouldering the start of "Havoc", the 23m grade 24. Below Far Right: Kent bouldering the start of "Gumboot Diplomacy", the 30m grade 23. Right of "Milawa", just around the corner you'll find "Havoc", the 23m grade 24 with four bolts (pictured right). Kent lead it on a previous occasion and the rest of us took a stab on top rope. I've never made it up a 24 before, but with many a hangdog I was able to do almost all the moves, getting stuck near the finish where the good flake holds run out. So if a slow and heavy Clydesdale like me can almost get up it, the line would have to represent an achievable result for many. Left of "Milawa" (as you face the rock), uphill a bit and around a corner, you'll find a couple of routes worth investigation. "Touch And Go", the 20m grade 17 with three bolts, and on the block to it's left "Scratch and Sniff", the 22m grade 20. "Scratch and Sniff" heads up past two bolts following a shallow vertical crack that eventually offers natural gear placements in the form of small wires (size 1 & 2 wall-nuts). It is well worth doing if grade 20 is within your leading range. It is quite achievable compared to some of the thinner grade 20 slabs in the area. You can launch off the good edge on the right of the block and swing across on smears to clip the first bolt. Continue up staying right of the first bolt to gain a comfortable stance from which the second bolt can be clipped. The crux then begins, as you work delicately up, side pulling that vertical seam with your left hand and seeking out the better crystallin edges with your right. The terrain soon eases off, however, and the aforementioned natural protection appears when you gain the better holds above. Belay is off two bolts with chains. A very rewarding lead! Check the Video Clip (3 Meg, 49 seconds) of me cleanly leading "Scratch and Sniff", sorry no dramatic falls. Heading around left (about 7 metres) from "Scratch and Sniff", you'll find "Gumboot Diplomacy", the 30m grade 23 with five bolts (pictured above right). It takes a line through the moss and looks way hard to me. The guide gives it a star, so it might be one to work if you're climbing well enough. Back up on the crest of the hill (near that "Eastern Outcrop" signpost), you'll find the "Virgin Summit Tor". There's a couple of routes worth doing here, but probably the pick of them is "Panda-monium", the 9m grade 17 (pictured left). The crux is at the second bolt, where you leave the shallow scoop, on-route to topping out. It helps to bridge out and get your feet as high as possible (see picture left). The belay is something of an adventure. You can sling a swaying gum tree branch that hovers above the block, and back it up with a couple of nuts in some of the dubious, hollow sounding summit fractures. Left: Me leading "Panda-monium", the 9m grade 17. Just to it's right there's also "Dicky Knee's Dihedral", the 12m grade 21, which the guide gives a star. The Northern Group offers the best concentration of climbs, but if you're looking to explore further a field, try tracking down "Mushroom Rock". Get back on the path that circles the hill, and head around clockwise until you pass some pine trees (not so easy to spot from the track). Go cross country through the pines and just above them you'll find "Mushroom Rock". A fun line here is "Pull The Ripcord", the 12m grade 16 (pictured below), that begins with an infamous tree start. The tree is half burnt away (see picture), but you can stand up on one of it's sturdier limbs to gain the opening moves. The route is bolted all the way, including two bolts for the belay. 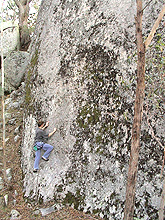 The crux is about halfway up, where slide pulling a shallow vertical crack and smearing up is required. The last bolt sits next to a crack that will accept all the fingers of two hands (and possibly a cam or nut), after which the route runs out the final low angle slab section to the new belay bolts. Above: Me Leading "Pull The Ripcord", 12m Grade 16 at Mushroom Rock. The tree start, and questionable belay chains turns an already fun sport route into an adventure. 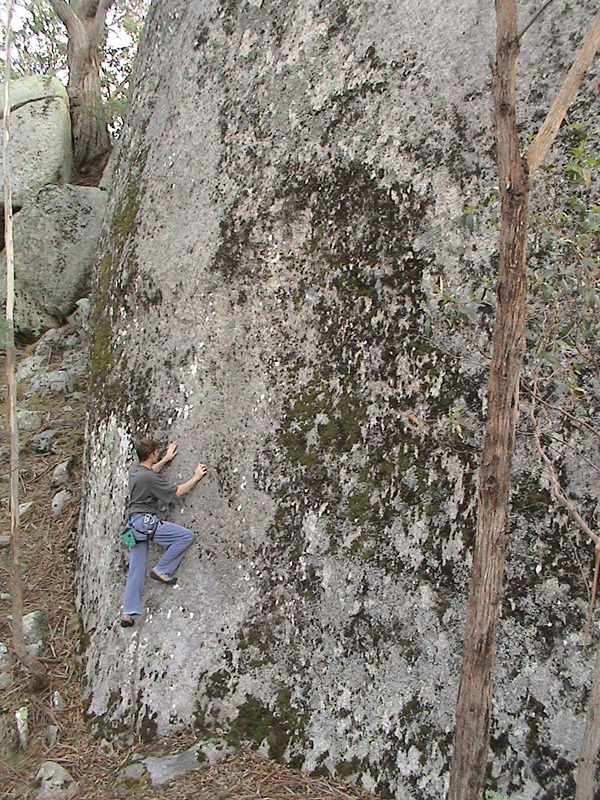 Below: Me leading, "Facing Page", the 8m grade 16 at Hollow Rock. Another area worth hunting down is "Hollow Rock". It's close to the circle track (on the high side), not far from the car park in a clockwise direction. It's location might make it a good place to investigate on the way in, or out. The routes are short, but at least "Facing Page", the 8m grade 16 (pictured below) has nice edges and fun moves. The crux is just above the second bolt, but it's only one or two moves and then you're in the bomber fracture (see rightmost picture below) and topping out with ease. With two bolts, plus a belay bolt, this route is worth finding, despite it's diminutive size. Immediately to it's left is "Binder", the 10m grade 19 (pictured below right) that utilities the arête on the left of the block. It's worth doing, though you might find it easier to stick to the face just right of said arête until nearing the finish. "Binder" can be tricky to second (risking a pendulum fall) while belaying off the bolt atop "Facing Page", due to the horizontal distance between these two lines. To get off this block, try lowering your second, then using him/her as ballast so that you can abseil off the other side of the block, in the opposite direction. Right: Kent leading "Binder", 10m grade 19 with a single bolt mid-way. The top out onto the arête is somewhat run out. When the heat gets too much for you, head on over to the near-by Turnpins Falls for an excellent swimming hole, assuming you don't mind sharing the pool with the occasional picnicking tourists and the usual local young'ns, who'll likely be leaping off the cliffs into the deep, black water (caution: I believe someone died doing this stunt recently). There's a couple of bolted climbs there (grade 22/23), but the rock looks a tad chossy to me. However, you can have fun bouldering right out of the water, and if walking is your thing, wander upstream along the river bed for a pleasant summer stroll. In winter, the water thunders down the falls, but in summer it's a polite little trickle.